This article is part of a series published by The Tyee and authored by professor of landscape architecture Patrick Condon of the University of British Columbia in Vancouver, Canada, drawing from the book A Convenience Truth: A 2050 Plan for a Sustainable Vancouver. 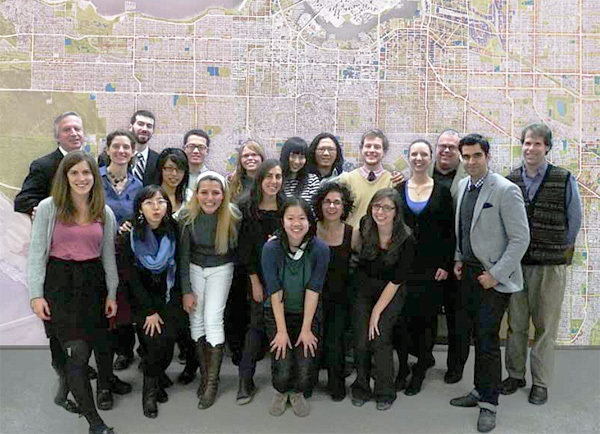 The research and future-focused design was done by 17 students in the UBC School of Architecture and Landscape Architecture and the UBC School of Community and Regional Planning. What happens when you ask 14 landscape architecture and three planning students to cut the energy use and consequent greenhouse gas (GHG) production in the city by at least 80 percent — by 2050? How is this to be done? We started by looking at the city of Vancouver as it is now, finding the places where energy use was high and where it was low, and trying to understand why. It turns out that energy use is lowest in the downtown. Not on a per hectare basis, though. On a per hectare basis, the production of GHG was higher downtown than anywhere else in the city. But on a per person basis, people living downtown produced only a quarter as much GHG per person as those living in the southern half of the city. Why? Two reasons. For one thing, most people living in the southern half of the city live in detached homes that, because they are exposed to cold air on all sides, take a lot of energy to heat. For another thing, because services are more spread out in the southern half of the city, residents are more inclined to drive than to walk, bike or take transit. This led to a question that we debated in class. Would it be better to simply repeat the urban form of the downtown as much as possible, expanding the footprint of the downtown towers into Chinatown and beyond? Or simply take every block within a 10 minute walk of a Skytrain (the city’s mostly elevated rapid transit system) station and zone it for 30-storey towers like they are successfully doing at the Gilmore Skytrain station area in nearby Burnaby? After all, the data says that is the most efficient density to use, and people sure seem to like high-rises. But, after a bit of study, a few problems emerged. First, if you follow that approach you end up with two cities. A city of gleaming glass towers spread like beads on the string of the Skytrain line, disconnected with the surrounding areas they overshadow. Second, it sentences neighbourhoods between stations to a future of slowly ageing residents, gradually shrinking populations, more empty classrooms, restricted access for young families, fewer commercial services, and an increased dependence on the car to get around. Third, while it is true that high-rises, when combined in large numbers, create GHG-efficient districts, the buildings themselves are not as efficient as mid-rise buildings. While it is possible to build a very energy-efficient high-rise and indeed possible to build one that even produces energy, that type of building is not the norm in our city. High-rise buildings are subject to the effects of too much sun and too much wind on their all-glass skins. And all-glass skins are, despite many improvements to the technology, inherently inefficient. Glass is simply not very good at keeping excessive heat out, or desirable heat in. Our high-rises, according to BC Hydro (the province of British Columbia’s main electric utility) data, use almost twice as much energy per square metre as mid-rise structures. Passive Design Toolkit: Image from City of Vancouver indicating that compact low rise structures are inherently more energy-efficient than high-rise towers. Fourth, we worried that while high-rises are an attractive option now, how will they age? Vancouver is full of examples where single-family homes have been adapted to house two or three or four families, with dormers added here and garage suites there, and basement suites inserted. But try as we may, we couldn’t think of an example where a high-rise had been adapted to a different circumstance. It seems a high-rise is forever. Fifth, high-rise buildings built largely of steel and concrete are less sustainable than low rise and mid-rise buildings built largely of wood; steel and concrete produce a lot of GHG. Wood traps it. Concrete is 10 times more GHG-intensive than wood. Sixth and last, our guest lecturers made us painfully aware that people living in single family homes do not appreciate high-rises as neighbours. Politically, it is a nonstarter. So the prospect of supplying the tens of thousands of housing units that our young families and elderly need in high-rise structures seemed naive at best. Instead we explored a different strategy, one that our situation as students and teachers made possible in a way not always easy for elected officials and city staff. We decided to see what might happen if we doubled the population of the city and placed all of these residents in areas outside of the downtown, avoiding wherever possible the problematic high-rise. Would it be possible to provide all those housing options but retain existing neighbourhood quality? Might we even improve those neighbourhoods as they grow? Could we supply enough units to house the burgeoning wave of elderly, who we know are coming, and the young families with children, who we fear won’t be able to afford to stay? And if we did all this, would this reduce our energy use enough? We discovered that there are three major ways to dramatically cut our per capita energy use, and to meet our housing equity and neighbourhood preservation objectives at the same time. 1. Gently infill all existing residential streets. The recent change to City of Vancouver bylaws, whereby each single family home site (in R-1 zones) can now legally include two rental units (one in the principle residence, the other in a lane house) provides enough legal capacity for tens of thousands of additional units, units with access to yards, neighbourhood parks, and neighbourhood schools. An overlooked element of this strategy is that a typical Vancouver bungalow, now being sold at the jaw-dropping price of over C$1 million, is wildly unaffordable for a typical young couple making a combined income of $90,000 year; but, it is affordable (albeit barely) if they can count on the additional $2,000–$3,000 in extra monthly income that the rents could bring in. Not only does this rent make the house affordable for them, but the owners provide a crucial social service in the process. They supply two affordable rental units in attractive neighbourhood settings for families or individuals who need them. 2. Build tens of thousands of primarily mid-rise wood frame mixed use commercial/residential buildings on arterial street. Vancouver has unused capacity for tens of thousand of additional residential units on most of its arterial streets. The market for this type of unit is robust (albeit held back during the past few years by the troubling increase in the cost of land). In some places, such as West 4th Avenue between Vine and Alma Streets, entire streetscapes have been slowly changed, and hundreds of units added, without engendering hostility from abutting residents. Typically, these four-storey structures replace rudimentary one-storey commercial buildings. When completed, the same or similar commercial enterprises re-occupy the ground floor commercial space. As units are gradually added, neighbourhood commercial services and transit become more viable, as thousands of new potential customers live above bus stops and commercial services. Our studio also discussed the benefits of this housing type for elderly residents, who would have the advantage of walking distance access to neighbourhood clinics, inexpensive cafes, and social support facilities. 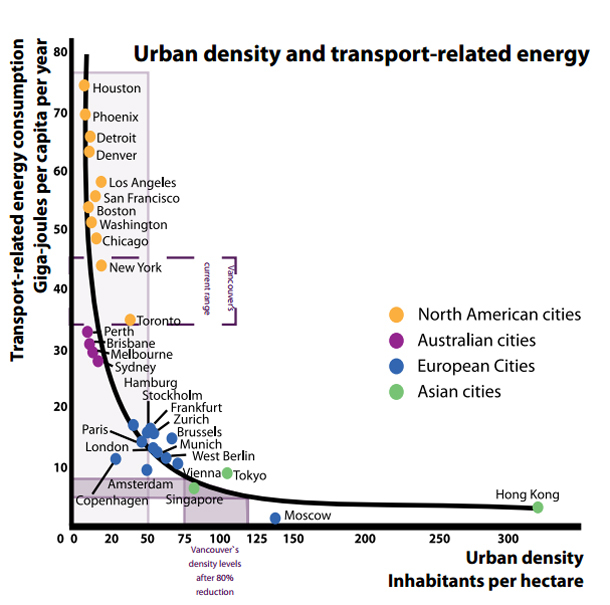 Research by Jeff Kenworthy and Peter Newman demonstrates the direct correlation between urban density and reduced need for GHG-emitting cars. Vancouver occupies the zone close to Toronto and Sydney where major gains can be made with relatively minor increases in density. Beyond the density of Vienna, conversely, increases in density provide proportionately less benefit. As we discussed the burgeoning proportion of the population that will be elderly, we became more concerned about where these seniors would live and more importantly how they would live. We emerged cautiously optimistic that development along corridors was, given the options, the best location in our city to accommodate what might be the most compelling housing (and health services) need of the 21st century. 3. 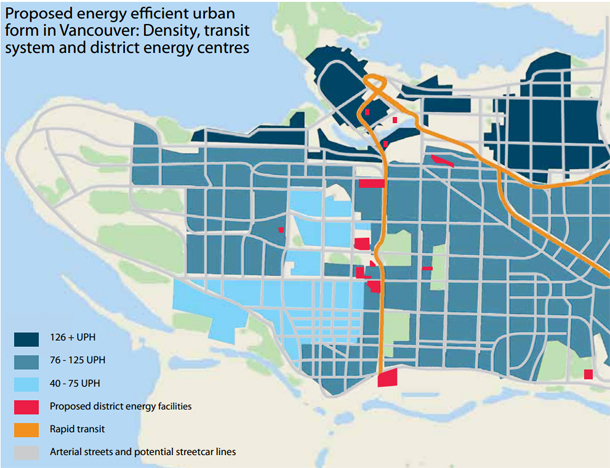 Expand the city’s district heating system up Cambie Street, then laterally from there. While we could use zero-GHG hydroelectric energy as the way to eliminate GHG from heating, using a high-grade energy like electricity for a low-grade use like heat is a waste. There are better options. The new system at the Olympic village uses “free” heat that would otherwise quite literally go down the drain: waste heat from sewage. Every street in the city has sewer pipes that waste a staggering amount of heat. The demonstration project at the Olympic village proves that it is technically possible to recapture it. The problem is the cost of installing all those district heating pipes in existing streets. That’s a lot of streets to dig up, and a lot of money to spend. If expanding this system at all is even possible, it would require an affordable, long-term plan. 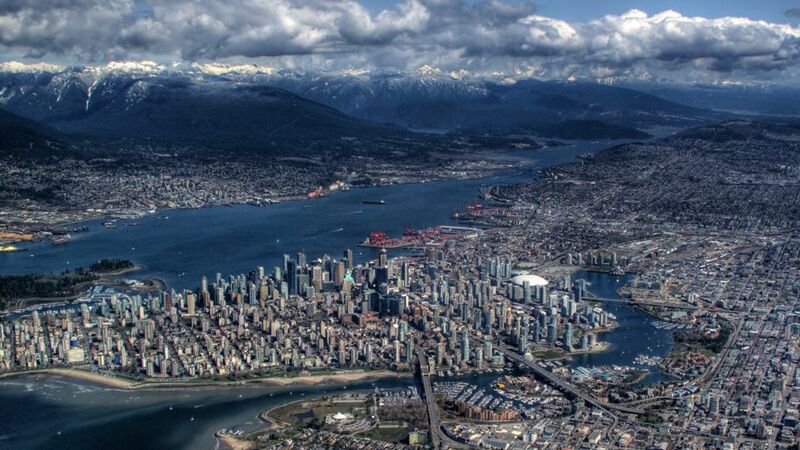 As it happens, the City of Vancouver is already developing such a plan. A plan for Vancouver that would provide district heating for the city while reducing transportation demand. Density is increased through gentle infill in all existing neighbourhoods, resulting in an energy use profile similar to that of Copenhagen by 2050. The jumping off point is the existing system at the Olympic village. The next step is to tie the Olympic village system into one that serves the Vancouver General Hospital area, and places in between. From there, the system could extend up Cambie Street, financed by development fees on new Cambie Street development projects. Such a financing strategy is commonplace. The City of North Vancouver already uses this strategy along Lonsdale Street, where new developments tap into and help finance the expansion of the Lonsdale Energy Corporation’s district heating system. Through this self-financing mechanism, a more extensive City of Vancouver system could eventually tie into new plants at Oakridge/41st and Marine Gateway. With this main spine in place, the system could follow the many east-west transit arterials to serve districts to the east and the west. Somewhere between 2050 and 2070, assuming a steady and incremental addition of new dwelling units along the city’s many arterials, a city-wide nearly zero-GHG heating system, one that is almost energy free to operate, would be in place. These three rules then, infill the neighbourhoods, line the arterials, and extend the district heating system, provide a possible energy element for a more sustainable Vancouver. Interestingly, the gains arrive mostly from spreading the new dwelling units throughout the city, and in this way create the financial and practical conditions necessary to dramatically lower the amount of energy we use for heating our homes, shops and workshops. Spreading this density throughout the city also changes its density profile to one more akin to Oslo or Copenhagen, places with climates not unlike our own and where walking, biking, and taking transit predominate. They predominate not because the Danes and Norwegians are more hardy than us, but rather because when a city’s density and services are in balance, it becomes easier to access the things you need on a daily basis by means other than a car. The authors standing in front of wall sized map of the city at 5,000 scale, showing enough housing and jobs for a city of 1.2 million. Back row left to right: instructor Patrick Condon, Niall MacRae, Peqi Wang, Rebecca Coulter, Jingling Sun, Patrick Chan, James Goodwyn, instructor Scot Hein, instructor James Tuer. Front row left to right: Lisa Lang, Margaret Soulstein, Jia Cheng, Cindy Hung, Neda Roohina, Paula Livingstone, Mary Wong, Nicci Theroux, Sara Orchard, Tate White, Sam Mohamad-Khany. A City that Runs on Itself by Patrick Condon et al. is licensed under a Creative Commons Attribution-NonCommercial-ShareAlike 3.0 Unported License. Patrick Condon is a professor at the University of British Columbia and holds the James Taylor Chair in Landscape and Liveable Environments. The entire team of authors for this report includes instructors Scot Hein and James Tuer; UBC candidates for Masters in Landscape Architecture Niall MacRae, Peqi Wang, Rebecca Coulter, Jingling Sun, James Goodwyn, Lisa Lang, Margaret Soulstein, Jia Cheng, Cindy Hung, Neda Roohina, Paula Livingstone, Mary Wong, Nicci Theroux, and Sara Orchard; and UBC candidates for Masters in Planning Tate White, Patrick Chan, and Sam Mohamad-Khany.